The only publication of its kind, Energy & Metals Consensus Forecasts™ is the result of a comprehensive monthly survey of over 40 of the world’s most prominent commodity forecasters covering over 30 individual commodity price forecasts including zinc. 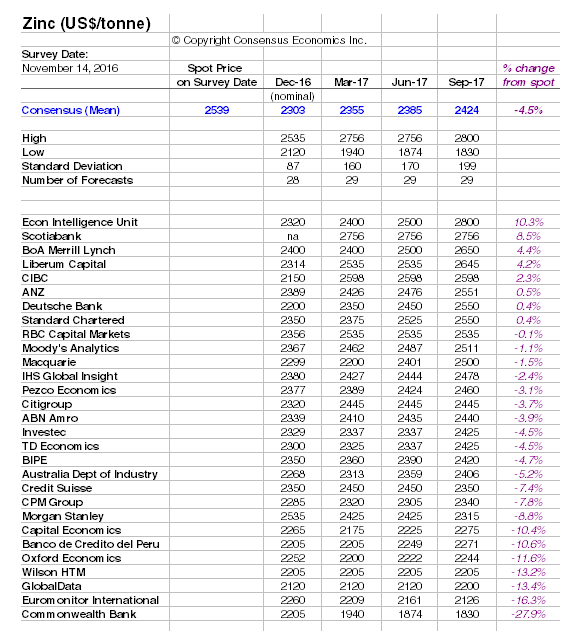 Energy & Metals Consensus Forecasts contains detailed individual analyst and average (mean) price forecasts for the next 8 quarters, as well as the long-term outlook and detailed graphical and written analysis. The publication has many practical uses including commodity investment analysis, risk management, corporate planning, and budgeting. The commodities covered have been selected for their global appeal and traded on prominent futures markets such as the London Metal Exchange (LME), New York Mercantile Exchange (NYMEX) and InterContinental Exchange (ICE). For example, the zinc forecasts below are based on LME cash prices for special high grade zinc of at least 99.995% purity. The table above shows a portion of zinc price forecasts taken from the November 2016 issue of Energy & Metals Consensus Forecasts. A complete sample issue of the publication, which also includes Consensus Forecasts™ for Aluminium, Copper, Lead, Nickel and Tin, as well as ferrous and precious metals, can be downloaded in PDF format by clicking the link below and registering your details.